KK Wind Solutions aims to cut wind power fluctuations by 90 percent. KK Wind Solutions is pairing batteries with wind control systems. KK Wind Solutions, a Danish wind systems developer, is planning to use turbine-based batteries to reduce output fluctuations by 90 percent. The company said it could achieve the reduction with storage levels amounting to about 8 percent of total wind farm capacity. Turbine maker Vestas, Danish engineering firm PowerCon and Denmark’s Aalborg University are also involved in the project. The organizations have previously collaborated on the development of multi-megawatt converter systems for wind farms. No completion date was given for the battery storage project, which aims to “improve functionality, stability, reliability and lifetime, as well as reduce procurement and maintenance costs” of turbines, according to KK Wind. There's growing interest in tying storage to wind. This month, for example, Toshiba trumpeted the installation of a 2-megawatt lithium-ion battery system near NRG Yield’s Elbow Creek Wind Farm in Howard County, Texas. The system is intended to correct short-term grid imbalances from intermittent wind generation on the Electric Reliability Council of Texas (ERCOT) grid. It can also “move blocks of generation from the hours when wind generation is high to the hours when load support is needed the most,” said Toshiba in a press note. In Australia, meanwhile, renewable energy developer Windlab is building a hybrid wind, solar and storage project after closing AUD $160 million (USD $123 million) in financing last month. The Kennedy Energy Park Phase I, jointly owned with Japan’s Eurus Energy Holdings Corporation, will have 43.2 megawatts of wind power, 15 megawatts of solar and 4 megawatt-hours of lithium-ion battery storage, supplied by Tesla. Vestas is providing the turbines. Also in Australia, Irish developer DP Energy is planning 400 megawatts of battery storage for the second phase of a hybrid wind and solar project. This month, Vestas and the EPC firm Downer were awarded contracts for the first phase of the Port Augusta Renewable Energy Park, featuring 220 megawatts of wind and 150 megawatts of solar. 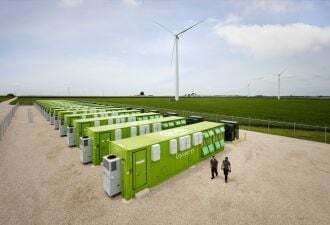 Interest in combining storage with wind has been building this year, with a Spanish developer stepping up battery research in May, and Dong (now Ørsted) and Statoil looking to add batteries to offshore plants. Vestas, which is featured in many of the recent wind-plus-storage announcements, flagged its desire to expand into energy storage in April. Vestas Chairman Bert Nordberg told Reuters his company was looking at acquisitions. Wind still lags far behind solar when it comes to storage adoption. As previously reported by GTM, solar-plus-storage projects are becoming increasingly commonplace -- and increasingly cost-effective. In May, for example, Tucson Electric Power achieved a solar-plus-storage power-purchase agreement below 4.5 cents per kilowatt-hour, beating the previous record set by AES for a plant in Kauai, in January. And research in August by the National Renewable Energy Laboratory pointed to the cost of solar-plus-storage beating standalone PV by 2020. Wind developers might be hoping to achieve similar results in future, but should be aware that the combination of wind and storage has not always been a success. GE, for example, has in theory been offering a storage-equipped turbine since 2013. GE's Brilliant turbine concept, which sounds much like the idea being pursued by KK Wind, hasn't gotten much traction. Only three units are known to have entered operation, at Invenergy’s Goldthwaite Wind Energy Center in Mills County, Texas. The 2.5-megawatt turbines were commissioned in 2014. Less than a year later, GE retired the Durathon battery line that was being used with the machines.